One week after parents, civil rights, and community leaders urged the Boston School Committee to bar interim Superintendent Laura Perille from applying for the permanent post, the board said Thursday it was unlikely they could prohibit any candidate from applying. If Perille decides to pursue the top job permanently, her candidacy could wind up with weak support from the board, based on comments some School Committee members made at a meeting Thursday night. But O’Neill also seemed to indicate that he had misgivings about permanently appointing Perille, who has never worked as a superintendent, principal, or teacher. “I also would like to see, barring any changes in the next few months, a superintendent who has been a superintendent” or a senior leader with a record of achievement, he said. There is a lot of interest in the job, but potential candidates have asked him if Perille will apply, and if she would have the inside track, he said. Perille, appointed to the interim post in July after former superintendent Tommy Chang and Mayor Martin J. Walsh abruptly decided to part ways, has refused to say publicly whether she would apply for the permanent job. As of Thursday, Perille still had not secured a state license to work as a superintendent. State rules allow new superintendents to work 90 days without a license. The subject of a new superintendent has been a sensitive one for the School Committee. Although the board is supposed to have full autonomy to hire, evaluate, and fire a superintendent, committee members had no say in Chang’s departure. 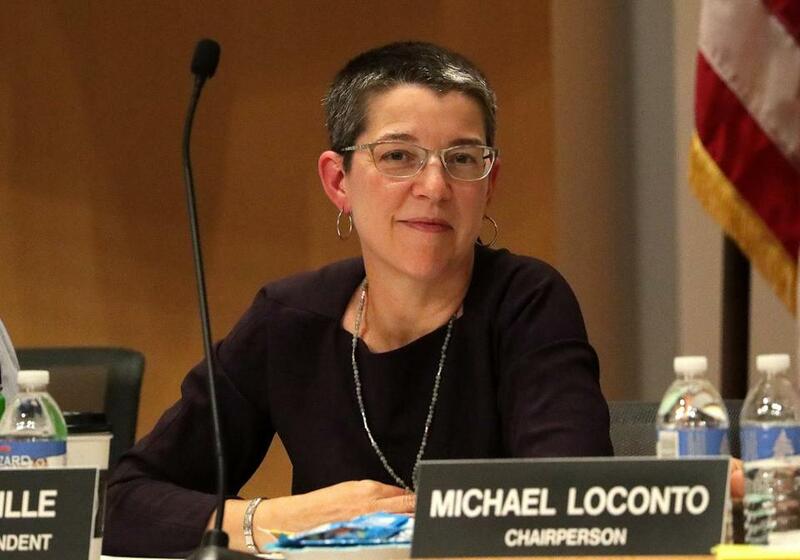 When the board met privately in late June to discuss Chang’s departure and to appoint a temporary replacement, chairman Michael Loconto offered up Perille as the interim leader recommended by him and Walsh, according to meeting minutes released last week. A week later the board, which is appointed by Walsh, approved the appointment publicly. Committee member Alexandra Oliver-Davila reflected on that vote Thursday night, as she made her case for not allowing Perille to apply. She said she doubted that if a person of color without the proper credentials sought the temporary post the individual would have gotten the job. Committee member Miren Uriarte questioned whether the board could legally prohibit anyone from applying for the permanent post. Uriarte and other members said the committee still has some big questions to answer: What kind of leader does the system want in its next superintendent? What kind of professional experiences and credentials? The committee also needs to decide what process it will undertake to choose a new leader. Loconto pondered whether hiring a search firm is necessary. Vice chairman Hardin Coleman threw out the idea of getting a waiver from the state attorney general to allow the committee not to publicly disclose the finalists. Some education experts contend that public searches discourage many talented leaders from applying, not wanting to fray relationships in their current districts. But committee members seemed to dismiss the idea, citing low public confidence in the process due to Chang’s abrupt departure and Perille’s appointment. “We really need to rebuild trust that has been lost over the past year,” said committee member Regina Robinson.